Feedback and information are necessary for the development of every business. If you are looking for ways to find out what your customers or employees think about your organisation, a questionnaire is one way to gather data without spending a lot of money. Questionnaires can be an essential way to carry out research and to collect and evaluate feedback about your company from your employees, clients, and potential customers. Below you will find 32 questionnaire templates you can use to improve your client and employee experience. Why Is a Questionnaire a Great Tool for your Business? A questionnaire is a series of questions, used to gather information from respondents. The questions are used for audience analysis and they are meant to create an understanding of the target audience’s feelings, perceptions, needs, and beliefs about a company, event, or group. Approximately 4% of dissatisfied customers give feedback. That means a staggering 96% of unhappy customers don’t say anything, they just never come back to your business. By understanding what your customers like and dislike about your company, you can implement changes in order to retain them. A client questionnaire is also a great tool for you to use in your onboarding process for new clients. A well thought out survey of a prospective client’s needs, budget and desired outcomes can ensure that you are both on the same page. Understanding what your employees like (and don’t like) about their job can go a long way towards retaining them. An employee satisfaction survey can show you where you can improve the working environment and increase employee engagement. Questionnaires don’t all follow a universal format. There are different types of questionnaires and the structure you choose depends on the type of information you are seeking. Before deciding on a format, think about the outcome you want and plan your content accordingly. Open-ended questions are questions that require an answer about the recipient’s thoughts or feelings. These are the best way to get information from respondents without leading them to an answer. They make the recipient think about what they are answering and the information you can gather with them, while harder to analyze, is often more beneficial for your business. What did you like about this event? What is the current financial state of your company? Closed-ended questions may be either simple yes/no questions or slightly more open-ended questions with multiple choice answers. They can usually be answered with a single phrase and are more specific and thus more easily analyzed. Is this question vital to the survey? Could the wording of any of the questions be considered offensive? Are the questions easy to understand or is your wording vague? Are the questions relevant and interesting to the person answering them? If it’s a closed-ended survey, are there a lot of answers to choose from or are you trying to gain a particular response from your recipients by limiting the number of available options? The sample size of your questionnaire will determine its accuracy. It’s often impossible to survey an entire population, but sampling only a small number of stakeholders may result in skewed data. The more responses you receive, the more accurate the data you collect will be. Below are 32 free questionnaire templates, to download and edit in MS Word. Whether you need help onboarding clients for your business, are working to create a satisfactory working environment for your employees, or are seeking feedback for your latest product or event, questionnaires can get you the feedback you need. Why not take a look at the free questionnaire template options below and see which would be best for your situation? Then you can simply download your choice and get started surveying today. A consulting firm, Marvin Consulting, Inc, aids companies in streamlining and improving their overall bottom lines. They give this business analysis questionnaire to clients in order to analyze the way in which the businesses are performing. Marvin Consulting, Inc. uses the questionnaire to create a plan for their client to improve its current state of business in order to become stronger and generate more revenue. This sample business demographic questionnaire is designed by a retail store that sells gourmet cooking appliances, utensils, dishes, table linens and related items. The company is considering expanding its online offerings and is using the questionnaire to measure customers’ interest in using their computers to order merchandise for home delivery. A to Z Manufacturing, a company that specializes in creating small parts for computers and other technological systems, has created this business impact analysis questionnaire. The questionnaire is given to each department manager in order to aid in discovering the key components of the various departments and the company as a whole in case of an emergency situation, such as a fire in the building. This business plan questionnaire is from a bank helping small businesses with loans. It covers all the necessary information to understand the structure of the business, the costs, and the risks involved with starting up this company. This sample business requirements questionnaire is from a healthcare center that is selecting an outsource company to perform billing. The questionnaire is for a billing service seeking a contract with the healthcare center. Upon submission of the questionnaire, healthcare center management will determine if the billing service meets the requirements. As a large manufacturing company with hundreds of employees, Wallace's Manufacturing and Technology, performs a yearly HR audit to ensure it is up to code with all employment policies. They use this HR audit questionnaire to ensure that all departments are up to code, follow policy and more. They also are able to see how their employees are doing and whether their hiring and selecting practices work well. For the ten-year reunion of Arcadia High School, the planners used this class reunion questionnaire. They took the biographical information to create a booklet that each attendee received upon their arrival; this booklet provided basic information about each of their classmates. Additionally, the questionnaire provided a way for the planners to discover the type of activities, food and more that would ensure success for the event. An investment firm looking to invest in an up and coming technology company is the subject for this due diligence questionnaire sample. The investment firm has heard about the technology and thinks that it will be the next big thing to hit the market. The questionnaire will help decide how risky an investment it will be. This survey template is used by a telemarketing company to ensure that the employees remained satisfied with their jobs. They had employees fill it out once or twice a year. Anytime they felt that the overall morale of the company suffered, they found ways to improve the company environment to retain the employees. They were also able to know ahead of time when an employee was hoping for a promotion or a better job. The following document is from a company that specializes in event planning to a potential customer. Upon submission of this event planning questionnaire, the planning company will have all of the information it needs to begin organizing the event. After having a high turnover of employees, a customer service call center company decided to implement this exit interview questionnaire sample when an employee left the company. Through looking at why people were leaving, they were able to see what was working in the company and what areas needed improvement. They were able to make some adjustments, leading to a higher retention of employees. A financial planning firm, Money Helpers, used this financial planning questionnaire to help their clients create a long-term financial plan. They have clients that are in financial difficulty and need to get out, and they have clients who just want to make sure they can save for a future expense, like college or a mortgage. For both types of clients, the questionnaire helps the firm learn how to create a personalized budget, plan and investment portfolio for each client based upon their need and situation. Donna runs a premier interior design company in Miami, Florida, called Donna's Designs. She uses this interior design questionnaire for all her clients, new and returning, before starting on any project. It provides her with the details she needs to create the perfect look for her client's home. Beauty Bunnies was a small business selling the best beauty products online. As it grew, many of the positions changed over time. After they had been in business for awhile, they used this job analysis questionnaire to reevaluate the positions in the company to see what everyone was actually doing. It helped to structure the company better and ensured that everyone was properly compensated. This job application questionnaire sample form is suitable for use by any hiring manager in order to find the best-qualified individuals for your company. It can be used in every business and every position that may be hiring within a company. The job content questionnaire sample listed below is from an automobile manufacturing company which intends to use the information gathered to outline a process on the manufacturing line, and determine what skills and experience are needed to perform the job efficiently and effectively. This job description questionnaire sample is from an employment agency that is responsible for writing job descriptions, and hiring staff for another company. A recruiting firm used this job interview questionnaire to ensure that the employees they sent to their various clients were an accurate fit. Through having concrete questions in front of them during all interviews, they were able to ensure that they accurately assessed each candidate. The example here is from a manufacturing company that values its employee’s thoughts and opinions. Completed questionnaires are used to evaluate how effective supervisors and managers are in running the company and what policies and procedures may need to be addressed and changed. This job satisfaction questionnaire takes the employee’s opinion into high consideration. The following is a marketing plan questionnaire sample from an Artist Representation Firm that will be working in congress with the Artist to determine a marketing strategy for the exhibition and sales of the artwork. The sample survey template is an online shopping questionnaire. The main purpose of this questionnaire survey is to obtain feedback about how people shop online, and to determine the demographics of the target audience. The initial questions in this online survey questionnaire sample are to be answered by the applicant, and they will allow you to find suitable participants by finding their likes, dislikes and personal habits in order to gauge whether or not they will relate to the questions of your survey. When a major advertising company, Ads for You, added an office in a new city, they did not have the time to properly interview all the qualified applicants. Their HR department used this pre interview questionnaire sample to narrow down the field. They were able to find the top candidates without wasting time on unnecessary interviews. A large investment firm uses this risk profile questionnaire for all of its new clients and some of their returning clients. It aids them in deciding how to properly invest the client's money in a manner that is appropriate for the client’s individual financial situation. A small investment firm, Hawkeye Investments for Life, provides a full service financial planning and portfolio investment for its clients. In order to offer the best service, they have all new clients fill out this risk tolerance questionnaire. It enables the account managers to know which investments will work best with which clients, along with how to accurately build the various portfolios. A small investment firm, Limitless Investments, Inc, created this small business questionnaire to give to companies that come to them for investment. It provides a detailed account of the business, including its potential for success and any risks involved with the company. The strategic planning questionnaire sample is from an Artist Representation firm that is using this information to outline a successful plan of action for an individual Artist's career. The Artist and the Firm will work together on a plan of action based on the assessment of the information contained in this questionnaire. A travel agency sent out this customer satisfaction survey to all of their existing customers. The information provided by completing this travel survey questionnaire will allow the travel agency to determine who to send promotional information to about different types of travel and different locations. This web design client questionnaire example is from a web design company to a new client. It is an opportunity for the client to explain exactly what they are looking for, and it gives the web design company a reference to use while building the website. This is a web design questionnaire used by a web design company to get a better idea of what each of their customers is looking for in a website. This sample focuses on the target market and the business, all of which is information that the web design company needs to build the ideal site for each customer. The following web development questionnaire sample is used by a web design company and given to all of their new customers. It allows the customers an opportunity to explain exactly what they want in a website and gives the web design company the information they need to build the perfect site. 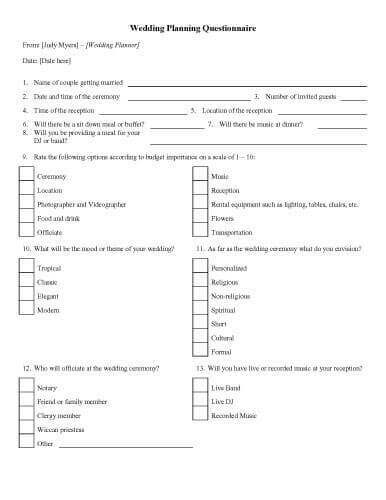 Here, the wedding planning questionnaire example is used by a wedding planner to ensure that she has all of the information she needs to plan the perfect wedding for her customers. It asks for information about the couple and the couple’s opinions about various wedding-related options.